Photo courtesy of Paul Flynn via Instagram. The King Street Transit Pilot has been underway for two months. To some, it is a roaring success, while to others, better transit service marks the end of civilization. 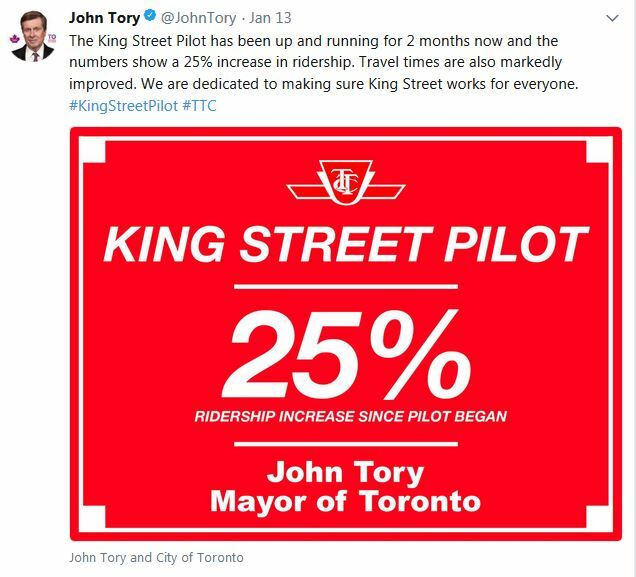 When this scheme was working its way to Council in 2017, rumours were that Mayor John Tory had to be encouraged to support it, and would have preferred to defer beyond the election. His vote to go forward showed promise, but there is backpedalling thanks to complaints from some businesses and the inevitable “war on the car” rhetoric from Tory’s presumed electoral opponent, Doug Ford. The effects of any change in how streets work should be clearly understood not just from anecdotes, but from actual measurement and observation. Ongoing review was designed into the project from the start, although there is inevitably a lag between data collection and reporting. However, this lag is much shorter than it would have been in the past thanks to “big data” collection about traffic behaviour and automation of the process to show conditions as they evolve. The December 2017 Dashboard summarizing the pilot’s effects was published late last week, and even more data are available to City staff and officials. Streetcar travel times across downtown are faster than before the pilot, although the averages reported by the City are smaller than improvements cited by riders who praise the faster service. 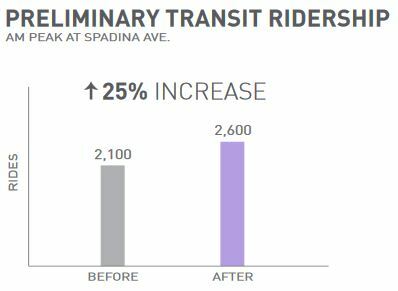 Demand on King is up as riders left behind by full streetcars can attest, but the TTC has published only one numerical before and after comparison. Route capacity is limited by the number of available TTC vehicles, although larger new cars appear one by one as they arrive from Bombardier. 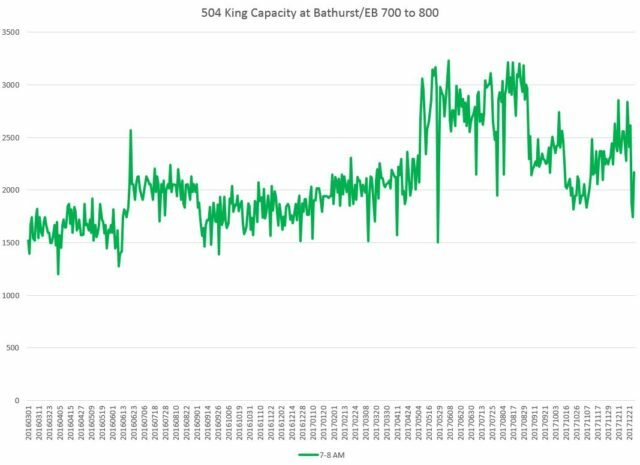 However, the capacity actually operated is still below the level of early 2017. Traffic and transit speeds on adjacent roads, notably on Queen, have not been affected much by the pilot itself, although they are still subject to the effect of construction projects. Enforcement of the new traffic regulations remains spotty, after an initial blitz, and problems remain at key intersections where cross-street traffic can block King thwarting the benefits of the pilot. Some pedestrian scale improvements such curb lane expansions of the sidewalk will not occur until better weather. How Fast Are Those Streetcars? 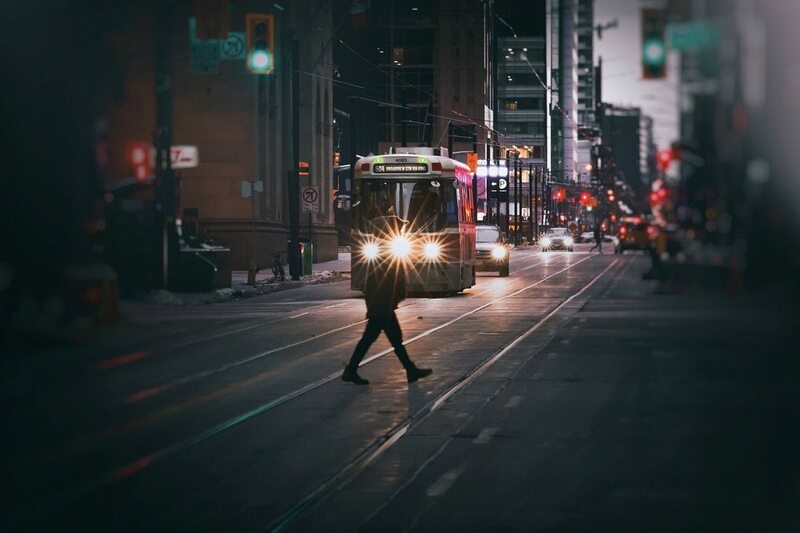 Based the TTC’s vehicle tracking data, the City’s transportation staff reported only a modest increase in the average speed of streetcars across the pilot area from Jarvis to Bathurst. Because congestion in the pilot area was worse in the afternoon, the effect is greater in the afternoon peak than the morning, but there is a limit to how fast streetcars will travel even under ideal circumstances. Stop spacing and traffic signals dictate the best case for travel times even with no competing vehicles on the road. However, the City reports yield a more conservative view than rider anecdotes about improved travel times. The difference lies in the averaging of results and the omission of worst case pre-pilot data. Riders do not travel at average times, but during specific periods, and they see the best and the worst the line has to offer. In recent years, King riders have endured the effects of construction projects on Queen Street and on The Gardiner Expressway, as well as diversions of their own trips. Conditions vary from hour to hour, and day to day. Travel times could be double the expected length or worse, and this would be compounded by irregularly-spaced service with long wait times. 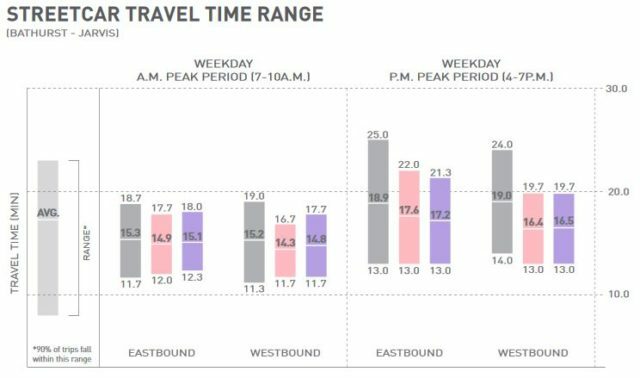 The range of travel times declined with the biggest changes in the afternoon peak. However, this decline is measured only against the better pre-pilot weeks when King Street was not affected by TIFF nor by spillover traffic from construction at Queen and McCaul streets. For example, the peak westbound pre-pilot time shown is 24 minutes, but during the Queen Street construction, this could be as high as 45 minutes. King can also be affected by major events at the Rogers stadium, but none of these fell within the pilot period to provide a comparison. One important reason for a year-long pilot is to see how it affects downtown streets not just under the relatively uncomplicated conditions of late fall, but during months when weather, construction, and special events add to the volume and variety of travel demands. The pre-pilot averages and ranges vary by day of the week, with conditions gradually worsening from Monday to Friday, and the pilot has reduced some of the late-week effects. Although the City only reports on peak periods, travel times have improved during the midday and evening. Peaks in the pre-pilot data show regular patterns in the theatre and club districts corresponding to their busiest periods, notably on Wednesdays and Fridays. The effects of this congestion reach well beyond the pilot area causing less reliable service over the entire route. King Street is busy at many times of the day, and a “transit priority” scheme that evaporates outside of the rush hour will not address all of its problems. How Many Riders Are There? TTC reports a “25 per cent increase” in ridership, but this refers only to the AM peak hour eastbound at Spadina. This value has been incorrectly cited as indicating an across the board jump in riding, but there are no published data to support this. Escalating claims about the results and using them to bludgeon critics is precisely the kind of selective data reporting this project must avoid to remain credible. The Dashboard’s graphic highlights the numbers, but puts the qualifier in small type. Mayor Tory dispenses with any qualification claiming an overall 25 per cent increase on the route. The same broad claim appears in the TTC CEO’s Report (p. 10) and has been repeated in the media. The combination of small changes in average travel time and over-eager reporting of ridership growth gives critics ammunition to argue that the changes are not worth the side-effects on traffic and local businesses. Demand on 504 King is heavy across the route. During peak periods, would-be riders are routinely passed by full streetcars west of Bathurst and east of Jarvis. If service reliability is improved with faster trips and fewer short turns, this benefits many neighbourhoods—Roncesvalles, Parkdale, Liberty Village, Bathurst/Niagara, St. Lawrence, Distillery, and Broadview—not to mention riders travelling in the counter-peak direction to jobs and and schools outside of the core. These benefits should be explored as part of ongoing monitoring for the pilot. What does riding look like on the route as a whole? Is there latent demand for more service? The TTC’s ability to take detailed riding counts is hampered by the lack of automatic passenger counting technology on the older streetcars, which provide the bulk of King Street service, but this is no excuse for gaps in the data. Even as the density grows along the streetcar avenues, the TTC has not addressed the question of latent demand on the network thanks to their vehicle shortage. How Much Service Is There? This statement is valid as far as it goes, but it does not reveal the full story about the changing peak capacity of transit service on King. That service has historically been provided by a basic service over the entire route, typically every four minutes or so, supplemented by “trippers” that filled the gaps between that service to bring a vehicle every two minutes. However, the number of trippers has been in a long decline, and other equipment changes (buses versus streetcars, large streetcars versus small ones) have affected the total route capacity. When the 514 Cherry route began in June 2016, the TTC did not bring additional cars to the King corridor overall, but rather reallocated what was there to focus on the central part of the route from roughly Parliament to Dufferin. This decision was a direct result of budget trimming at the City and TTC. Trippers continued to operate, first with streetcars and later with buses. In January 2017, the TTC cut back the number of bus trippers, but larger streetcars were assigned to 514 Cherry. The high point for capacity was reached in the spring of 2017 when the longer cars normally operated on 501 Queen shifted to 504 King. The capacity fell from June 2017 onward. Only recently did this begin to rebound with the introduction of new streetcars and the shift of bus trippers to 505 Dundas in exchange for streetcars on King. 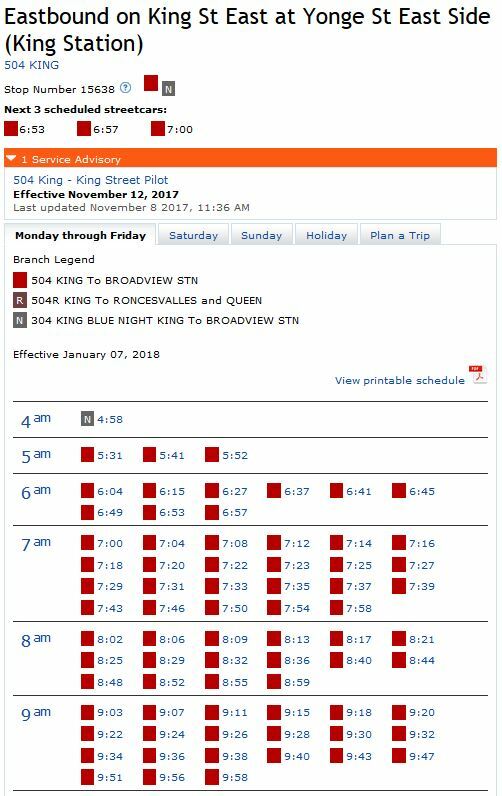 On several occasions the TTC claimed to be adding capacity to King with buses when what really happened was that buses replaced existing streetcars. The highest capacity was provided only when the line operated entirely with streetcars. A further problem for riders is the way in which the trippers are scheduled. They provide a “wave” of frequent service, but this appears at different times on different parts of the route. This wave comes east across King between 7 and 8 a.m., travels west in the 8 to 9 hour, and then comes east again. 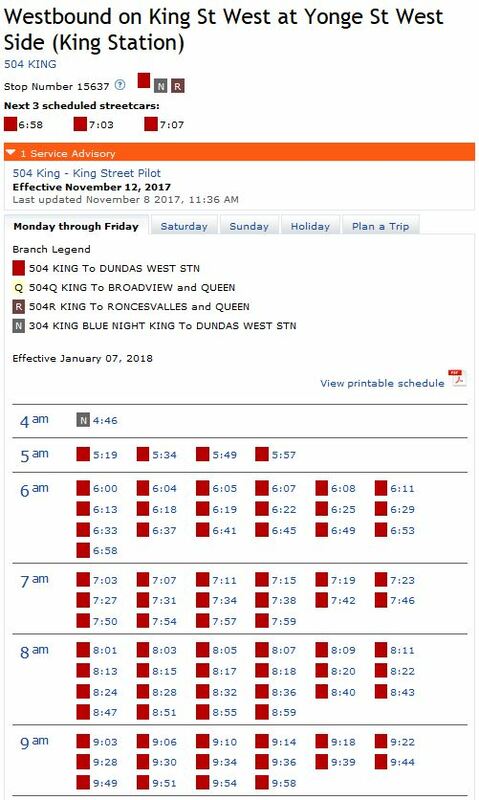 The result is that service inbound from King West is actually worse between 8 and 9 a.m. than it is in the hours before and after. Moreover, the number of trippers has declined over the years, and what was once a wave of 16 cars might be better described now as a ripple of only seven. This reduces the period during which King sees very frequent service. The 514 Cherry service adds 7.5 cars/hour on King between Dufferin and Sumach streets. The term “headway” refers to the space between two vehicles and in theory, this is scheduled gap. However, no route runs to schedule for various reasons, and even the TTC considers a vehicle to be “on time” when it is no more than one minute early or up to five minutes late. On a frequent route such as 504 King, this means that service can be “on time” but still running in bunches. During November, the headways leaving Broadview and Dundas West stations inbound to downtown improved substantially after the pilot began. Fewer cars were short turned and operators had time for a break at terminals rather than fighting their way through traffic. Indeed, backlogs of streetcars at terminals awaiting their scheduled departures are now quite common. Cars do not leave like clockwork from the terminals, and inconsistencies in headways tend to be magnified during their trips as short headways get even shorter (following cars catch up to their leaders) and gaps widen. Headways at Yonge Street are commonly spread over a range from almost zero to 10 minute even with the pilot in place compared to scheduled values of about four minutes. Many of these cars are on time by TTC standards. Although the pilot makes an indirect contribution to service regularity by letting most cars reach their termini, it does not eliminate bunching because this originates outside of the pilot area. TTC operations typically do not behave well at terminals even with a completely segregated right-of-way (as anyone riding 512 St. Clair will know). Even if the pilot were extended to a wider area, bunching would likely remain without a change in the TTC’s organizational culture that accepts a generous standard for on time performance, and does not regularly meet even that. When Should Auto Access be Restricted? Calls for the pilot to be scaled back at least from evenings and possibly even to peak periods only are shortsighted and do not address the range of benefits the pilot has brought to transit service. A common error among critics of transit priority schemes is the assumption that the peak period is the only one that matters, and if only the off-peak could revert to heavier use by motorists, all would be well. This completely misses the point that there are substantial transit benefits during the off peak. These have not been reported by the City and TTC because of their focus on peak conditions. However, for the TTC system as a whole there are more off peak than peak trips, and this is particularly true on busy routes like 504 King. Reliable service is important not just in the pilot area, but along the entire route. Before the pilot, late night short turns when service is less frequent were common, particularly on nights when the entertainment district was busy. With the pilot, late night service has improved, although this will be threatened if traffic restrictions disappear either through a policy change or simply from motorists who simply ignore the rules. When the pilot project was approved, City Council added an exemption after 10 p.m. for taxi cabs. One can understand part-time exemptions for what are, after all, a form of transit vehicle with a greater presence on King Street in the evening than the TTC. However, the degree of any exemptions raises questions about the actual effects on the street. An important change in the street layout was the creation of dedicated zones for loading as well as pedestrian zones where, come better weather, activities normally confined to the sidewalk can spill onto the curb lanes. If these are to be workable, they must be in place all day and cannot disappear just to provide a few more parking spaces outside of peak periods. Adding more exceptions to the “transit priority” zone will further complicate signage. It is not practical to expect motorists to read a long text with all of the rules as they approach an intersection, and the valid moves must be communicated with simple directional signs that adapt to rules in place at various times of day. The City plans to add some illuminated signs such as those now used for left turn restrictions at some locations. On the business front, some owners have been quite vocal in their opposition to the pilot, and they have engaged the media and some politicians to their cause. The City, as they did with the Bloor Street bike lane project, plans to obtain credit card activity data from Moneris to see the actual level of change in business activity. This applies not just to the pilot area, but to other comparable parts of downtown where the brutally cold weather would be a contributing factor to any downturn. The City needs a much better understanding of where customers for businesses on King Street come from, and how they arrive—car, taxi, transit, cycling, walking—to put the claimed effects in a proper context. The King Street Pilot is definitely working by improving transit service on the route both downtown and in areas beyond. For its part, the TTC must respond to the unexpected jump in demand with more service. An announcement of the plans for mid-February changes is expected shortly. More data on ridership across the route are definitely needed and these must look beyond the peak period. While the short-term issue is King Street itself, the larger question is how many more people the TTC could carry, and how much demand for transit service would materialize if only reliable service were there on the street. Enforcement of the new traffic arrangements is essential if the pilot is to remain truly a transit priority effort and not dwindle through neglect back to business-as-usual. The City plans to roll out a new cadre of “Traffic Wardens” to take over many duties now performed, when they are available, by the police. They could do worse than heading directly to King Street. The success of this project cannot just be measured under ideal conditions, but must also consider the effects when road and transit capacity are lost to construction and special events. These are common, especially downtown, and the City should understand how the road and transit networks are affected by them. City Council should resist the urge to back away from the pilot before its behaviour is understood through a full season of events, warmer weather and a higher concentration of tourists who will not be familiar with the street. Fine tuning is an essential part of any pilot, but Toronto should have the courage to make the best of this project rather than throwing away its benefits.